OK so wheres the story CF!!! Can’t recall seeing that tank on our last trip, but knowing you I am sure you found it lurking in the background somewhere! An interesting image and very much has a CF stamp on it! Are we going all dark again? Time to bring back the lambs !!!! Nice lighting and colour in this one CF. Tanks! With a title like that I was expecting something from the Armoured Brigade with a turret! 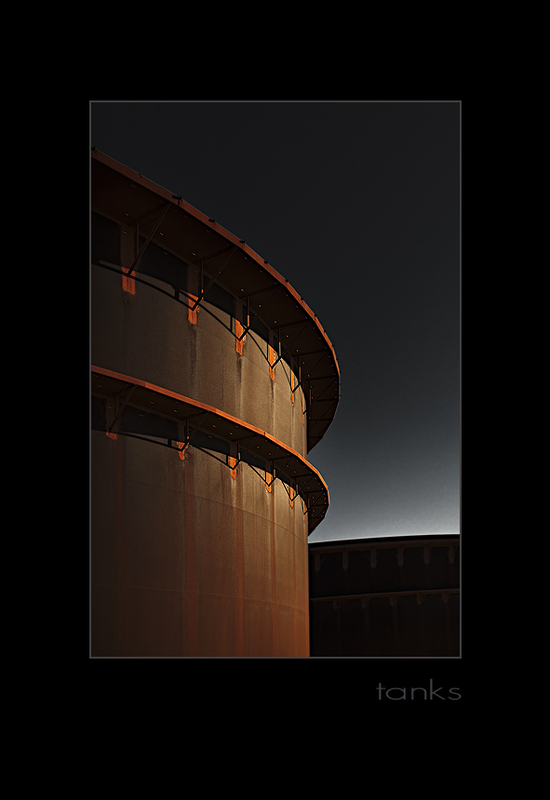 Seriously nice image, I like architectural simplicity of the structure in the image and the colours, industrial. Could get you yet another Gold. Very nice CF… looks like a really clean and uncluttered architectural arty image. I like the dark sky and the bright red ramps. and you’ve gone and got Merv all worked up…. boys this is a top secret location, can’t talk about it!! matt sorry mate, if I knew someone with a tank I’d shoot it, not literally!! I like the architectural nature of this too. Sorry there isn’t a story Stephen, I have taken an oath of silence. Ah Varanus island. Or somewhere in the Montes. Nice shot. Think as the tank as a person and there’s a story! So are these tanks on Varanus or are they the new Condensate tanks on the Pluto project? ?